Jo has always dreamed of starting her own business, but the arrival of her two gorgeous toddlers has put her ambition on the backburner. Then she hits on a brilliant idea – a kids’ clothing shop with a twist – and is thrilled when it really takes off. When husband Lee offers to quit his job to look after the family while her business grows, it seems a godsend – but will their marriage stand the test of reversing their roles? Jo soon recruits Holly and Mel to help her in the shop. Designer Holly’s high-flying career has come crashing down and she’s moved back home – but is she ready to manage a major family crisis? Meanwhile, Mel worries her teenage daughter Serena is going off the rails. Is finding out more worth risking her daughter’s trust? At the crossroads of their lives, friendship could be the only the thing keeping these wonder women strong. I have had Wonder Women on my To Be Read pile since July and I have to say I was a little put off by the size of this book, I mean 570 pages falling on you when you fall asleep will hurt! 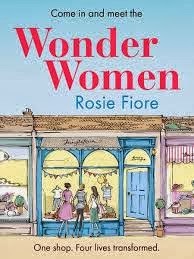 I had no reason to worry though as there is no way you can sleep after you start Wonder Women as it is so addictive and I found it impossible to put down. Jo has a dream that she opened up a childrens clothes shop that was child friendly, with the support of husband Lee she decided to makes this dream a reality and before long her shop is open with the help of co-workers Holly and Mel. Holly has just arrived back from Africa after a terrible time and when Jo offers her a job in her new shop it feels like a life line. Mel takes a job in Jo’s shop which is perfect to work around her 15 year old daughter although Mel feels as though her daughter is increasingly shutting her out. I have read so many books this year that I have loved and enjoyed but this book was not only pure entertainment it was also so exciting too. To watch Jo every step of the way in creating her business and see it develop really had me hooked, and each stage of the progression of the business really kept me interested in the storyline. What was so great about this book was our three main characters Jo, Mel and Holly they are such strong and confident characters which is so refreshing as many characters in chick lit books are very lovable but also quite weak and vulnerable characters but this is not the case with these women they know what they want and they will get it one way or another. Only a few chapters in the ladies already felt like friends of ours as they were so life like and also quite homely characters. There was a wide range of characters in this book all who played a great part in making a great storyline. There are many touching issues that are focused on in this book and they were beautifully written especially the situation with Holly’s mum. I loved this book so much that as soon as I finished I couldn’t wait to get my hands on more of the authors novels so I quickly downloaded Babies in Waiting too!